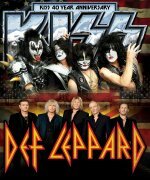 Def Leppard and KISS will start their Summer Tour 2014 of the USA and Canada on 23rd June and there are 42 days to go. The first show takes place in Salt Lake City. All of the previous live shows in this city are listed below starting in 1981 on the High 'n' Dry tour. The 23rd June show will be the 15th visit by the band to this area.